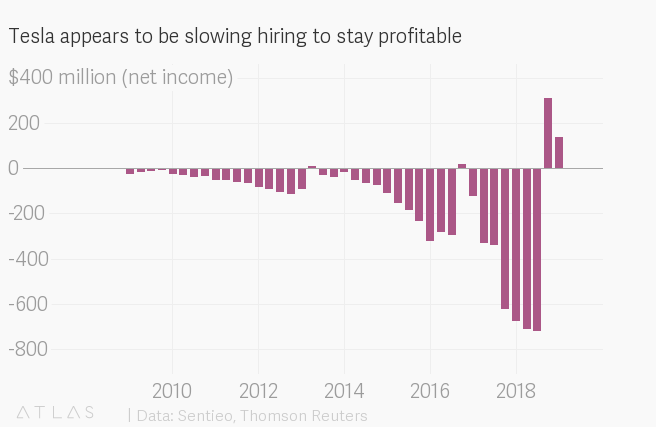 Tesla’s headcount is slowing its roll. 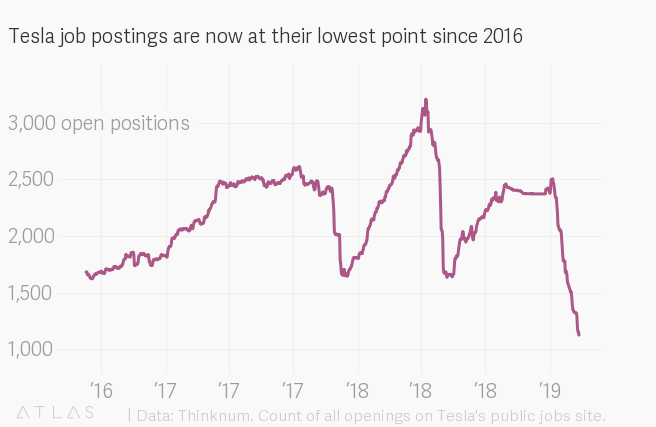 Tesla positions are growing scarcer. Openings on the electric-car maker’s jobs site have fallen precipitously in recent weeks as the company tries to maintain thin profit margins. Although Tesla’s total headcount roughly doubled after 2016 to about 49,000 employees last year, the company appears to be pulling back sharply on new positions and recruitment, according to the business intelligence firm Thinknum which uses data from multiple sources on the web. On Feb. 2, the number of open positions posted by the company fell below 1,600 for the first time since 2016. On Feb. 25, it stood at 1,129, with the number continuing to decline sharply each week. Similarly, the pace of recruitment appears to have slowed. 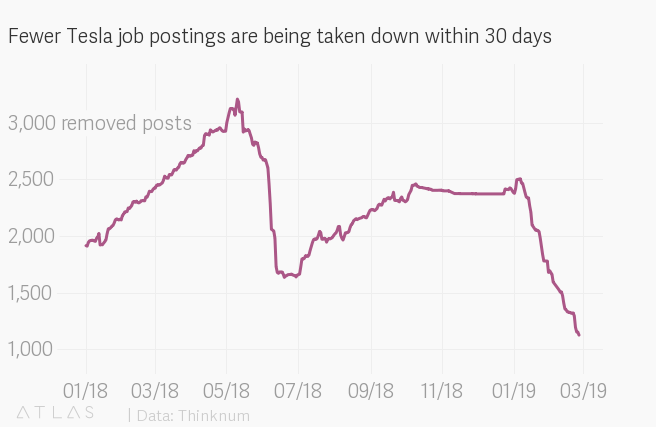 More jobs are remaining on Tesla’s jobs site for more than 30 days, according to Thinknum. Last May, more than 3,000 job postings were filled or taken down within 30 days. In the past month, the number of positions that remained on the site for less than 30 days had fallen to just over 1,000. Tesla has already announced two rounds of layoffs affecting more than 5,000 people in the past year. Last June, Musk told staff in an email that a “comprehensive organizational restructuring” would cut 9% of the workforce, to help achieve profitability after 15 years without being in the black for the year. Most cuts were salaried positions, sparing crucial Model 3 factory workers. Then in January, Musk announced another 3,100 company-wide layoffs. This time, more than 800 cuts also came at the company’s Fremont facility, which cut labor hours per Model 3 by 65% during the second half of 2018, as well as another 78 at its Palo Alto headquarters, according to notices filed with California regulators (pdf). “We have to be relentless about cost in order to make affordable cars,” Musk said in a Jan. 30 earnings call, according to Sentieo. “That’s what our headcount reduction is about.” Tesla recorded combined profits of $451 million over the last two quarters in 2018.